How do I Keep Scrambled Eggs From Turning Green? 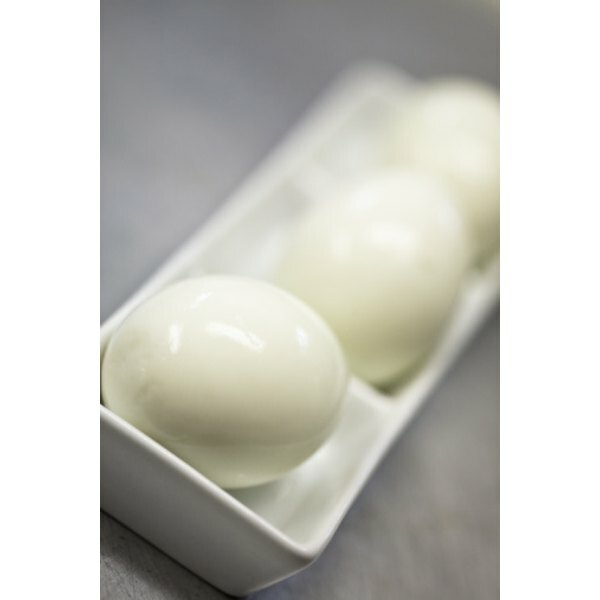 Hard boiled eggs are full of protein and an easy to make snack. 1 How do I Keep Scrambled Eggs From Turning Green? 2 Why Do Boiled Eggs Smell? 4 What Causes an Eggshell to Stick to a Boiled Egg? If you have boiled a lot of eggs, then you may have noticed that every once in a while you get a green ring around the yolk. The ring may even, at times, look gray. Although the ring can be ugly, it is safe to eat. However, if the discoloration bothers you, keep in mind that it is common and easy to fix. The ring around the yolk of a hard-boiled egg is sometimes caused by a chemical reaction from sulfur and iron, which is a natural reaction. The sulfur, from the egg white, and iron, from the yolk, form ferrous sulfide on the surface of the yolk. This is ultimately what causes the discoloration around the yolk once it is boiled. When you cook eggs at too high a temperature for too long, the yolk may turn grayish green. This discoloration can also happen if the egg is cooked for too long at too low of a temperature. The key is to place the egg in cool water, bring to a slow boil and then remove from heat as soon as it stops boiling. Let it sit for 15 minutes. How you treat a hard boiled egg directly after you cook it will determine whether you will get a green ring around the yolk once it is cracked. You must remove the egg from the hot water once it is fully cooked, after 15 minutes, and place it in iced water so it can chill. Leave it in the water until completely cooled. Refrigerate eggs in their shell until you are ready to eat them. Most of the time, the green ring around the yolk is caused by overcooking, which is easy to fix. However, the green ring can also be caused by too much iron in the cooking water. If you think that this is the problem with your eggs, then simply use bottled water when boiling eggs. Can You Eat an Egg That's Been Frozen?